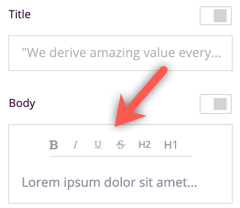 However, you can also change the font styling in the Title field as well using inline HTML styling. What goes inside the "....." is where the styling fun happens! Color - "color:blue;" or "color:#000;"
Before you leave, we have something special for you! You can add all your text in the Title field and style it to your liking! Separate sentences and paragraphs using a break (<br>) tag. This is great if you want to have a Title, a Body, as well as smaller texts for your Terms and Conditions.